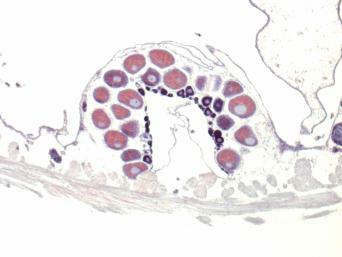 Cross sections through the ovary of S.clava collected in the month of August from Mission Bay, San Diego. 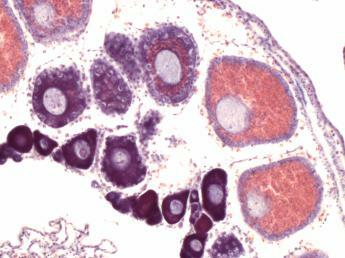 At this time year, the water is near it's warmest, and numerous occytes in all stages of development can be seen, from the small, dense dark purple stage I oocytes to the surrounding larger pink, eosinophilic stage III oocytes containing large nuclei. Each ovary runs lengthwise along the inner body wall inside two layers of muscles, the outer circular muscle (cut lengthwise) next to the tunic (removed) and the inner longitudinal muscles (cut in cross section). Left, 5X obj. Right, 20X obj.